In the last year, I have finally stopped wasting food (since I always seem to think I am cooking for an army) and I have started freezing food. This comes in especially useful now that I have to leave the house for work everyday, and therefore need to think about lunch. Actually, one of the biggest drivers for me to cook every night is the fact that if I don’t, I will have to buy lunch the next day. Buying lunch the next day equals expensive, and not always so tasty. So cooking and freezing is a win all around! Why the talk about freezing food? Well, this meal was a direct result of getting creative with some frozen left overs! I had been wanting to make homemade baked beans, I had been wanting to eat my brisket that was in the freezer (recipe here) AND Lara made an amazing coke-based BBQ sauce….it was the perfect storm! The recipe popped into my head, I had a day off, and it would provide a super healthy lunch for both me & Lara all week. Done! The final ingredient in this perfect storm? I didn’t think there was ANY way Ryan would buy in to a bean-based meal, but he loved it! It is just that good! Meanwhile, pour chicken broth over the sitting beans and place on medium-high heat. Allow it to get to a simmer, but not a boil. This entry was posted in Recipes and tagged BBQ, Beans, blog, blogger, boston, brisket, Coke, main course, main dish, recipe, sauce, side dish, side Dishes by reneeh. Bookmark the permalink. Ohh I love baked beans. I can vouch for this – I was stuffed all week with the delicious meal (even if it did make the office smell like a good roadside BBQ joint). Nothing beats homemade baked beans! These look soo delicious! I just emailed this to myself, it looks fantastic!! 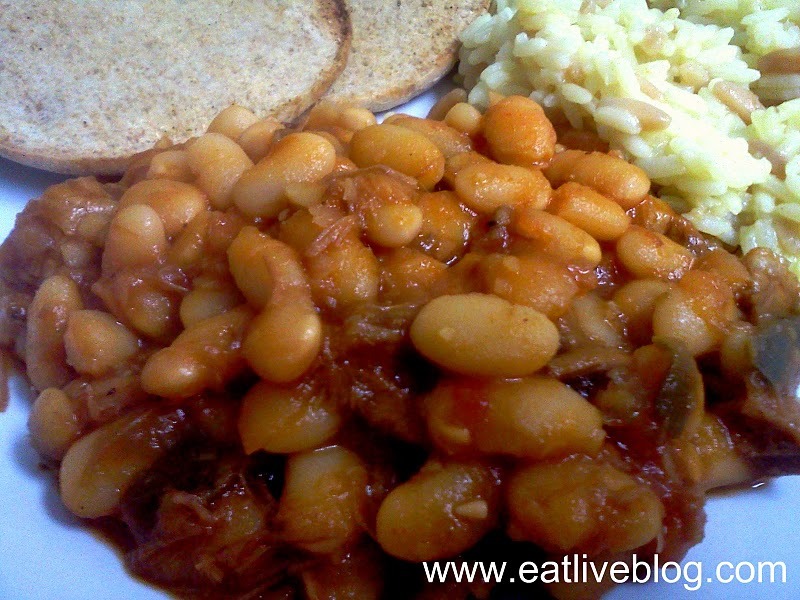 I love to have my husband smoke a brisket and serve it with beans like this…. anxious to try your recipe. Thanks for linking to Saturday Swap! I have my Mother’s recipe for Brisket…but I must say I am going to have to try yours….yummy! Pingback: Meatless Meals Recipe: Homemade Black Bean Burgers! « Eat.Live.Blog.